I got different answers from each person I talked to because each person had a favorite part or attribute. So I ended up asking them about their favorite feature. Much of this information shows up in the later questions. What were the challenges in getting the car to America? The engine was the primary challenge, as they needed one that already met the US requiremnts. Tooling for the larger manufacturing numbers required a bigger investment. Even apparently little and simple things like lighting standards were a challenge. As Roger Becker said, he is proud of the teams effort. There are no official performance figures. The manufacturing configuration has not been finalized. Lotus frequently quoted 4.9 seconds for 0-60 and 12 seconds for 0-100 and a top speed of 150mph. They also indicated the 0-60 time dropped by .2 seconds with the sport package tires. 1975 lbs. I had some nice conversations with Lotus about weights and they planned on using dry, curb, or weight with driver. They wanted to be more forthcoming with real weights. It is not clear if the 1975 is the final weight of a production car. Very well, apparently. They crashed a car, then thought about getting a waiver on the front end crash structure. The tests were so definitive that the car passed. There were no specific figures given. That is not to say it will be inexpensive to fix the car after an accident. The crash test did not affect the tub, however if the tub were damaged, it would need to be replaced. Repair costs are roughly the same as those required for a BMW or similar car. Lotus added three "life style" colors to the original line. A lime green, chrome orange, and an even darker silver than Titanium. I will add the official color chart later. What are interior colors or options, Alcantera? The touring package comes with full leather. The base and Sport packages come with partial leather and partial Alcantera. See the options section below. Roger told me two years ago power brakes and antilock were going to be a regulatory requirement in the European Union in the life time of this car. I do not know if that is still true. The antilock brakes were a sensitive issue to Roger and Nick and was mentioned in press conference. They claim to have done a typical Lotus engineering job on the brakes and they only were felt a few more than 20 times in a trip around the Ring. Each person had a happy experience! Alastair drove to watch the Sun Chaser, Roger is proud of his son's ride and handling efforts, and Tony was excited about the car on American roads. What is the essence of Lotus? How is the car different from any other exotic? Small and light. I did not ask this of everyone but the comparisons were always showing up. Lotus public relations were always interested and pleased with the emotion they found here. They were focused on reestablishing the brand here and were interested our thoughts on how to further the effort. What are the challenges of marketing this car? None. The cars for the first year are sold. The cars for the second year are probably sold and the first and second year buyers will sell more. There is some concern about people buying the car that do not understand it and therefore being disappointed. Will there be any marketing at the start, given the few cars we will get? How will it match with the marketing going on in EU? At one point, I expressed an interest in competing cars and was a bit surprised at the answer. 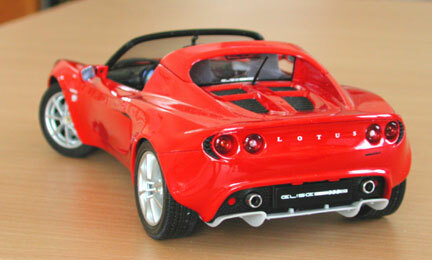 Lotus does not view the Boxster or the S2000 as competition. I suggested that my alternative is the Subaru Sti. They found the same thing in Britian. The car is expected to be an extra car, sitting alongside a Corvette or other performance car. That being said, the cars that fall into the same price range and perceived performance might be the Boxster and Honda S2000 as they are two seater convertible sports cars. Why did it take so long to bring it to America? Quite simply, demand for the car in its original overseas markets was 300% of what was initially projected. Until the new production facility was built at Hethel, capacity was just not large enough to fulfill additional U.S. demand. That is the word from Lotus. However I believe there were many other issues, as reported in British Press and from internal sources. What is the strategy with options? What are the primary options being considered? My favorite, wider front rim? The sport package inludes forged wheels and an inch wider front rim. The car with this package will right harder and may not be desirable for normal road driving. Interestingly, there is much that is the same and much that is different. For example, the lighting regulations are very different and so the removal of the lamp in the inside taillight cluster leaves the socket only in the US version.Of course the engine and all associated plumbing is different.Much of the suspension is the same except some parts are reinforced for the US version. More importantly, what US parts will find their way on to the EU spec cars? Yes, Lotus views this as an opportunity to make more money as the options are a high margin item. They view it as selling their primary expertise of ride and handing. Will the Sports suspension option be available? Is there a cold air kit that increases horsepower? Yes, to a certain extent. For example, Lotus will offer three levels of exhaust, each progressively lighter and louder. They cannot ship the louder exhaust on the car as the car must meet strict sound regulations, especially in Europe. However, once the car is delivered, and depending on the state, the owner can fit a different exhaust.It will be extremely difficult for after market companies to offer an exhaust with the same performance level as the one offered by Lotus. The exhaust tube is bifurcated at a specific distance from the header. This distance is critical and if not duplicated, power will be reduced. Can the passenger side airbag be disabled? No. There is no plan to offer a switch. However, a comment was made by a listener that it is a simple matter of removing a fuse to disable the airbags. While suspension packages may transfer, the differences in the configuration and use of the car suggests it might not be a good ideal Lotus mentioned several times that they were surprised at the poor condition of the roads in the US. The highway cracks beat the suspension dramatically and so the parts needed reinforcement.>Lotus also has a poor impression of some of the aftermarket wares and finds they often reduce the performance of the car. Some of this might be the manufacturer's position but in many cases seemed to be backed up by actual measurement. Yes, as well as "Kermit" green and a dark, dark silver. Will my local Toyota dealer be able to fix the engine? No. The ECU is completely different, as well as the programming that is included, and encripted. The car is OBD II compliant so many of today's devices available will be able to read the generic codes from the car. However service often requires a deeper analysis of what is wrong and that will require more expensive and specific test equipment.The mechanical parts of the engine will be the same and could be fixed by a dealer if they are so inclined. However the warranty is supplied by Lotus and not Toyota and so service must be provided by Lotus. What about service for people far from a dealer? unknown. It is unlikely that normal service will be available away from a Lotus dealer. Lotus will have test equipment available for delivery to far away places, in order to help get a car back to a dealer for service. Will Lotus provide club activities here? There was some discussion about having a race series and other activities, but these may have to rely on local dealers for funding. Can I order parts under warranty? Lotus will have service representatives on both coasts. It is not clear if they will be able to approve parts orders. It will be up to the individual dealer. They will be able to buy parts but will not have technical training on the earlier cars. Have dealer allocations been made? No allocations have been made. No dealer knows how many cars they will get. Is Lotus going to help police dealer activities? No. The dealers are separate from Lotus and there is only so much Lotus can do legally. For example, Lotus cannot require the dealers to sell the car at MSRP. How many orders are there so far? Lots! The number is not known and so "soft" as to not be of interest. For example, one dealer has taken only 20 orders and then stopped. They have a list of 60 additional people that want to order the car but since the dealer does not know how many cars they will get, they stopped at 20. (This is a more honest approach than some dealers that have taken over 100 orders. )It is also not known how many orders will result in car sales when the cars finally get here. Some orders might be by speculators or people may have gone ahead an bought something else.My sense is that the first year's allocation is sold and probably the second year's as well. How quickly do you expect to work through those? What will cause Lotus to go to double or triple shifts? Nothing. I pushed on this and there are limits to the manufacturing process and suppliers that prevent an easy ramp up. Also Lotus will be concerned about hiring additional staff, ramping up, only to have the backlog quickly evaporate. This news is not good. Manufacturing is still scheduled to start in May and shippments the same time. There was much talk about the promises dealers were making to the customers. By my calculations, dealers are likely to get 40 cars or so in the first year. NO DEALER ALLOCATIONS HAVE BEEN MADE! Will all 38 dealers be receiving cars in eight unit increments? What is the future for US cars? I almost got this! Unfortunately, others were hanging around and the Lotus person turned quiet. How will you take care of the waivers? Interestingly, first there really are not that many waivers. Second, some of the waivers are simply a matter of testing. The headlights probably conform to the requirements but have not been tested.A redesign will be required for the bumper requirements and that requires a restyle and retooling, which will only happen on the next version. Can we expect future models? Absolutely. Lotus views the American market as necessary for its success. Will the 2007 Elise meet Federal safety standards? I do not know how to answer this. It is a safe car and meets the current crash standards. Can I get an Expose? I talked with Tony Shute about the car and how his then 13 year old son helped come up with the idea. There are new technologies of plastic vaccum forming that will be investigated at Lotus for future use. Tony Shute has plans on going to Canada to determine what changes are required. The bad news is that the 5mph crash regulations will be difficult to meet and worse, Canada is not willing to provide waivers. What are your thoughts on the US introduction? What did I forget to ask or would you like to see in my articles? I never reached the end of a discussion with any Lotus person. They were all willing to spend as much time with me as they could. I ran out of time before I ran out of questions.I spent time with Nick Adams, Steven Crijns, Tony Shute and his son Robin, Alastair Florence, Arnie Johnson, Dave Simkin, and Roger Becker. They were all well spoken and willing to share their thoughts about the current car. I will write up my discussions and post here. I will also add the pictures included in the press pack, some new, and will post the various press releases as well. *Questions asked by various people on line, in forums, or in person. In response to your "Longing for a car without a stove" (AW, Jaundiced Eye, July 27), let me raise my hand and be called upon. There are numerous reasons why the manufacturers have lost me, such as the number of gizmos that are included in a price that is beyond my reach or desire. I long for the return of the days of no airbags, no ABS, no traction control, no DRL, no side-impact beams, no fwd, no plastic body cladding and yes, no radio, heater or variable wipers. Even rubber mats might be a consideration. Sigh. . . you can call me "Sally." Copyright 1995 through 2013, all rights reserved.